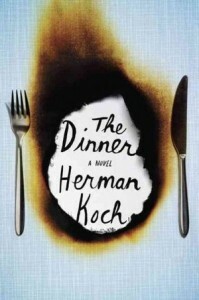 Pageturners book discussion group enjoyed a lively discussion about The Dinner by Herman Koch. We had mixed ratings for this with comments running the full spectrum of “I hated it” – to “I loved it.” The book’s been compared to The Slap with its author Christos Tsiolkas describing it as a “deliciously uncomfortable read”. We’d have to agree. Just to recap, The Dinner is about two couples who meet in a posh restaurant over three courses to talk about their teenage sons and the bad things they have been doing……Discussion comments included – it was believable, I really liked it, it touched on a whole range of things – discrimination, migrants, mental illness – and kept you reading. It made me feel quite angry, the kids needed a good kick in the tail, they turned into criminals. 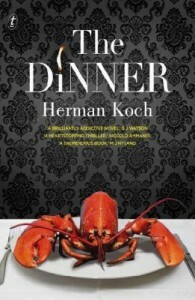 It was quite amusing – an expose of the expensive restaurants – then it became unpleasant covering up for the kids. It was well written. I’m glad to be rid of it. It was disturbing…..
Pageturners meets next on Wed 14th May at 5.30pm to talk about books on the Miles Franklin Literary Award Longlist http://www.milesfranklin.com.au/2014/2014_longlist And we’ll try and guess the winner….